Oh Snap look what came in the mail!!! 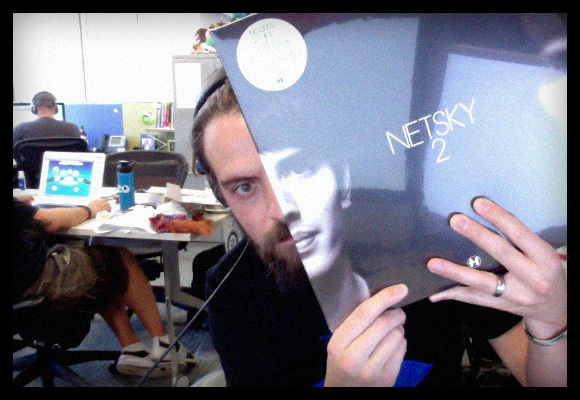 New NETSKY2. Wicked stoked. Thanks to Turnstyle for the hook up and the wicked fast shipping. 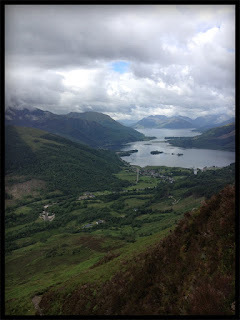 So I've been busy catch up since my trip out East to the mother land of Scotland. Two weeks being unplugged from technology, jet lagged and dealing with the lack of darkness due to summer solstice made for a grand vacation. Your friendly neighborhood Technics dealer. Photo Credit: Addison H.
Shortly after arriving in Glasgow we fetched a train up to Inverness. Inverness although lacking a good electronic dance music store had plenty of pubs, clubs, and novelty stores to keep our jet lagged brains amused. The following day Scotland foolishly let me hire a car to drive about in, (LOL stupid people). So it wan not "tramping" around like all the books I was reading, but our travels around the Highlands would have looked like a Family Circus map. Driving down along the length of Loch Ness, around the Isle of Skye a few times, hoped a ferry on our way to Fort William. Load of hiking and sight seeing but no real record hunting. (Whomp Whomp). Returning the car we hitched a train to Edinburgh, my home away from home. It felt great to stretch my legs on the streets that i grew up in. Visiting old hunts, and checking out new ones. As coincidence would have it, my parents were in town that week which I have to say is the most amount of time I've spent with them in nearly 10 years. It was great! 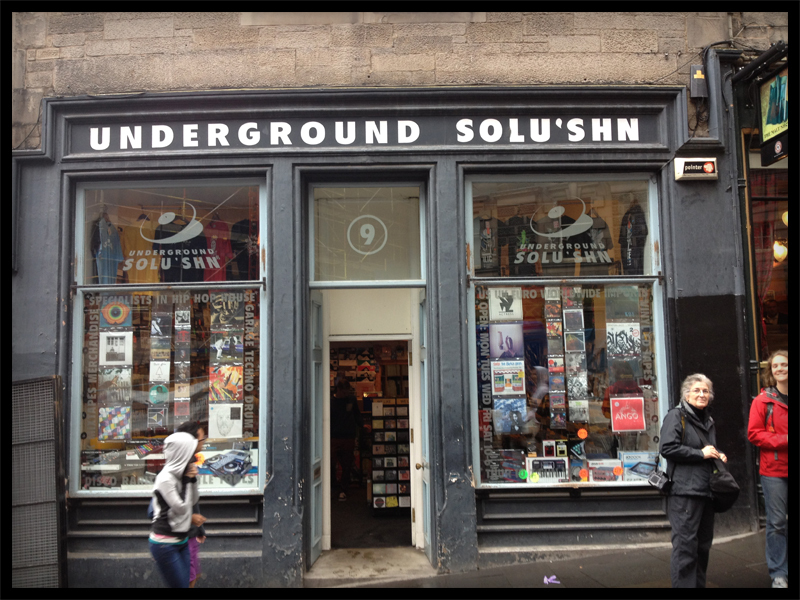 Now 10 odd years ago, I walked into Underground Solu'shn at the bottom of Cockburn Street and fell in love with this intimate record store. The staff was helpful, engaging and did there best to impart some wisdom of what was moving crowd in the Scotland. 10 years later I found the staff to be just as engaging. Although George Macdonald was on vacation, Andy...(I hope that was your name) was super nice, and did his best dealing with a DnB head. Smiling. 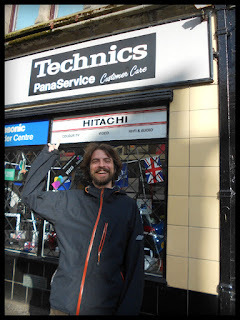 What was more striking to me was I handed him a demo and he straight away put it on blasting it over the store speakers. That gave me a bit of a thrill to hear my mix being play. Hat Tip. HOT DIGITY DING DONG! Its the mother load I thought. Although not as impressive as the golden plaster of the Sterling castle this comes in at a close second. 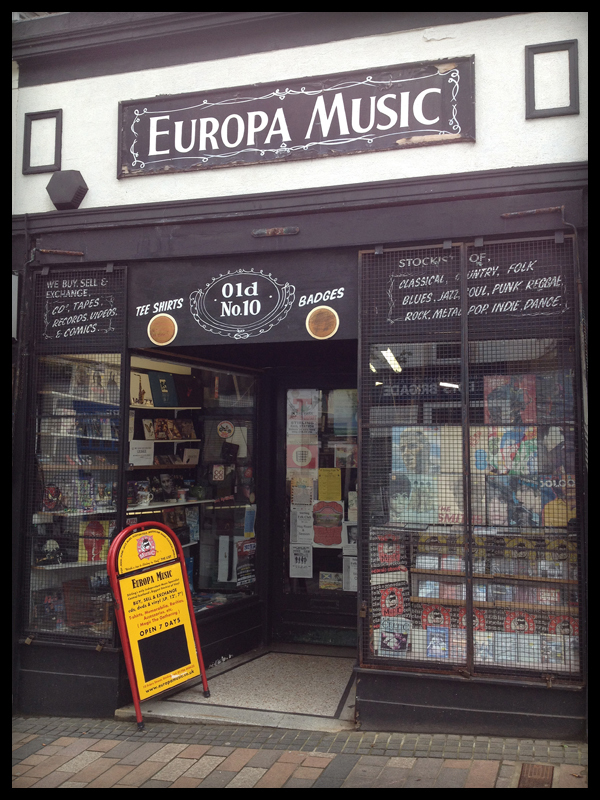 If your looking for Shut Up and Dance records, early Techno, loads of Acid House and a smattering of Jungle records. Get off this computer and do directly. On the topic of mother loads I should note that Avalanche Records in Edinburgh's Grass Market has a stock pile of dance records that is mind boggling. If the story true they bough most of their dance records from an unnamed BBC DJ that had been stock piling promo records over the last 30 years. I was able to find some unplayed ragga jungle tunes from the 1994-7. Mind you I also had to clean the mold off these records... but thats a small price to pay. 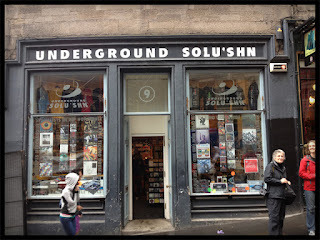 If your looking to make a record buying holiday for DnB / Jungle records do not go to Scotland. 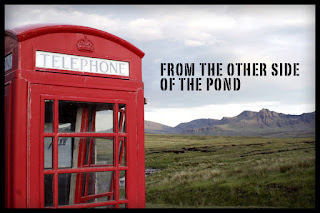 It stand to reason that an country that hates its neighbor, is working on separating itself from "Great Britain" would of coarse not pay any attention to the London sound that is Drum & Bass...oh well. With that said I love Scotland, the people, the country side, their beer, and Veggie Haggis. The adventure was totally epic and I'm glad to have been able to share it with my partner in crime Addison, who did not roll her eyes to much every time I dipped into another moldy record shop. Cheers. Anybody can play bangers all night, it’s another thing to be creative with your time slot and still get the crowd pumped up. The big guys have earned the right to play the headlining spot and thus reserve the right to play the songs of the season. Don’t make them edit their set and go to different cuts because you don’t know your role in the show. Have some respect and common sense and use it as an opportunity to be creative with your artistry. NOTES from The Librarian: Play vinyl, keep it slow and keep it older (5 to 10 years back), you can play a few "old school" classics but don't hog all the classic by stringing them together. It’s an honor to open for the artist and play in front of their fans, you should support the show accordingly. The hundreds or thousands of people in the crowd are most likely there to see the headliner play their songs. Don’t be the idiot who tries to steal their thunder. Show some respect to the those who have actually produced their own tracks, been picked up by a record label and put their music out on Beatport. Between 10pm-12pm, guests are arriving in the club, buying their first drinks and getting settled. They aren’t ready to throw their damn hands up until they’ve had plenty of drinks in them and they see enough people getting wild. Also, they aren’t ready to “Save the World” before midnight. Any DJ who blows their load too soon will leave the crowd wanting for the rest of the night. There’s a real tendency for opening DJs to think they are the star of the show. When you play fast, hard-hitting songs above 128 bpm into the red or put the volume at level 10 the system gets maxed out and the room is way louder than it should be that early in the night. It’s easy to get carried away with the energy and excitement, but you give the headliner no room to adjust the volumes properly and effect their sound. NOTES from The Librarian: If you ever put a mixer into the red I hope a sound engineer or an older DJ comes by and smacks you off the decks. Personal pet peeve. After you leave the decks it’s obviously crucial to leave the RCA cable and any ground wire in place with no excuses! If you are going to do this then you probably shouldn’t be an opening DJ and need to find a new career path. Being an opening DJ requires a unique skillset and venues need to be screening them to make sure they recognize their position and follow these simple DJ codes. NOTES from The Librarian: I hear this logic but I will admit I will generally have to unplug CDJ's to connect my dub siren and my sampler in. 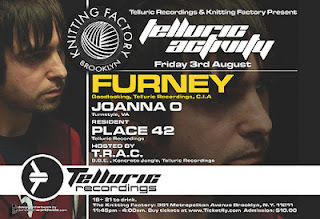 However I generally unplug and replug things in during my own set so as to not cut into other peoples time slots. While I was out and about in the motherlands of Scotland. Rob One from Surface Noise Productions came into the Annex Studios and tore up the wheels of steel in my absence. 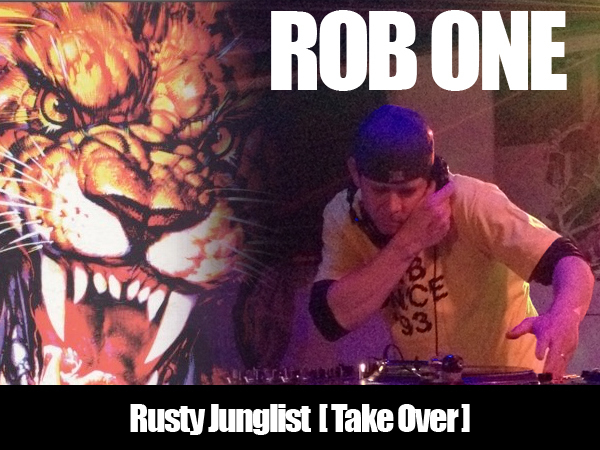 Big ups to Rob One, this man is a monster behind the wheels of steel. You can normally find him playing out with the Transit Crew, keep your eyes out for this guy.